main pic of teapot - a Brown Betty? teapot interior - a Brown Betty? Pottery mark query - 5-pointed star on teapot - a Brown Betty? - I have a teapot....I *think* it's (guess I need somebody to identify that part for me also!). 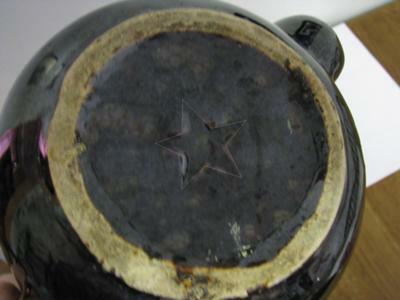 It has no writing anywhere on it, and the only marking it has on it is a 5-pointed star embossed on the teapot bottom. Teapot exterior is a dark brown glaze, and the interior is a gold glaze. Just curious as to know where the teapot was made, when it was made, etc. Many thanks for submitting your handsome teapot and making your comments. See discussion below for suggestions and arguments. 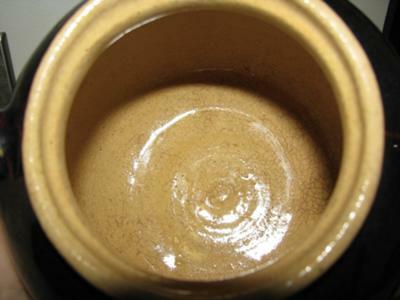 Comments for Pottery mark query - 5-pointed star on teapot - a Brown Betty? Dear Yvonne, Is the star impressed, i.e lower than the bottom of the teapot base inside the star or is the star higher than the bottom of the teapot? Hi Blake! The star is impressed/embossed into the teapot (that is, it is sunken into it, not raised up off of the teapot). Dear Yvonne, The mark as you describe it is impressed. (Embossed is when it stands higher than the surrounding body.). 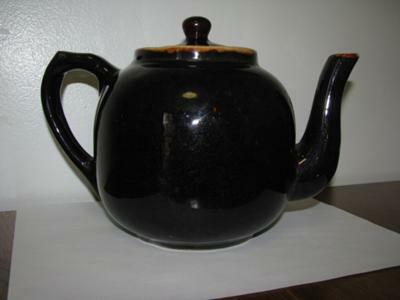 Your teapot was made by Star Stoneware of Crooksville, Ohio. They were in business from 1892 to 1945. Your impressed mark is an older mark dating from around 1903. I hope this is the information you were looking for about your teapot. Thanks so much for your information Blake! This is great! Are you able to tell from the picture of whether or not this might be a Brown Betty teapot? Dear Yvonne, All authentic Brown Betty Teapots have two things in common: they were made from a red clay and they were made in Stoke-on-Trent, England. Try doing a Google search for "Brown Betty teapot". There are several excellent sites on the teapots history etc. Your teapot is NOT a brown betty but it is a 'brown betty type'. The real deal is made of English Brown clay and is only made by one pottery manufacturer now. Use one and you will never want to use any other teapot.... If you can get one, don't let it go - or break it. The more modern ones are not as well made as the old ones so do look in estate sales and the like as you might get lucky. I also would like to know about the raised 5-star on the bottom. I have an Asian set with this on the pots along with T T in double diamonds. Can not find out about the raised star. If you could please help me I'd really appreciate it!